Tom Hudson, 93BA, has climbed the ranks of financial journalism to present the acclaimed PBS Nightly Business Report. As a young boy, Tom Hudson often sat around the kitchen table watching his mother balance the checkbook, or he'd accompany his father on trips to the bank. They provided his first glimpses of the world of finance and what money means to a family. A long way from the kitchen table, Hudson, 93BA, now sits at the helm of the nation's longest-running, most-watched business news program on television. Earlier this year, Hudson became the co-anchor of PBS's Nightly Business Report, rising above more than 100 competitors to succeed 30-year veteran Paul Kangas. His ability to make financial news meaningful to the everyday American—combined with his Midwestern charm—impressed producers. Soon, Hudson relocated his family from Chicago to Miami, where the weekday program is produced and distributed to more than 250 PBS stations. 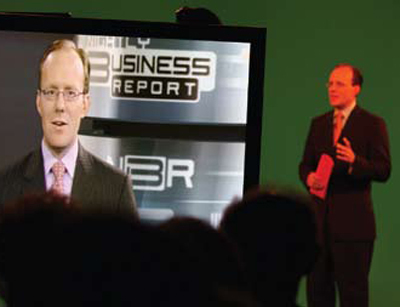 "The Nightly Business Report franchise is the standard bearer of business journalism integrity and this responsibility is not one I take lightly," says Hudson, who previously coanchored the nationally syndicated Chicago-based television broadcast called First Business. "I have a chance to help reinvent the program at a time when we're reminded again how important economic news is for all of us. Our economy has gone through so much in the last 18 months—money news is never too far away from our daily lives." A typical night draws around threequarters of a million viewers who tune in for the Report's critical, unbiased assessment of the day's financial happenings. Thriving on the intellectually demanding challenge of deciphering the sometimes vague and esoteric language of business news, Hudson manages to present an engaging, concise, and helpful broadcast to the general public. The show's stories cover a range of international and domestic topics, from the declining financial viability of Social Security to why certain foreign economies are improving at a faster rate than the United States'. While Kangas prided himself on being a student of the market, Hudson intends to offer a fresh and far-reaching journalistic approach to what he calls "the interconnectedness" of the global economy, looking for different trends across markets and what they mean to the average person. "Wall Street in particular has done a wonderful job of alienating itself from people," Hudson says. "My goal is to educate and empower the public to make good financial choices."